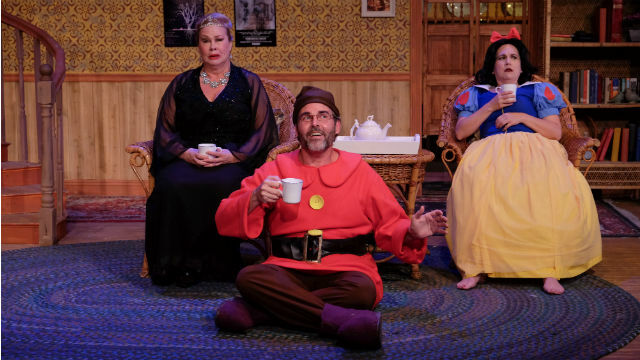 A scene from “Vanya and Sonia and Masha and Spike” at Scripps Ranch Theatre. When a costume party is introduced in a play, it’s a pretty good bet that the proceedings are going to turn silly…and dark. Actually, that’s a good description of the life’s work of playwright Christopher Durang. But in any absurdist theater, the hope is that, amid the ridiculous, there will be some sublime. The first time I saw “Vanya and Sonia and Masha and Spike” was at The Old Globe in 2014, shortly after the play had won five prestigious awards as Best Play of 2013. That was hard to fathom. It was literate and clever, of course (that’s Durang’s stock in trade), but I didn’t find it funny at all. So, I was kind of reluctant to revisit the piece, now running at Scripps Ranch Theatre, though I admired the cast and its seasoned director, Kathy Brombacher (former founder/artistic director of Moonlight Stage Productions). I’m glad I went. This is a tighter, tauter, funnier production. The screeds aren’t shouted rants. The humor, though very broad at times, is allowed to breathe and land with some semblance of subtlety. It may never be my favorite play (or even my favorite Durang play) but it is smart and sharp and thought-provoking. The themes, à la Chekhov, from whom all the characters (except Spike) derive their names, are about aging and regret, accepting change and moving on. Two middle-aged siblings, Vanya and Sonia, lament their lives. Both unmarried, they live together in the family farmhouse in Bucks County, PA (lovely, detailed set, by Bob Shuttleworth, with lush greenery outside the homey living room; well-lit by Jennifer Edwards). The costume party down the road gets all the principals to dress up like characters in Disney’s “Snow White and the Seven Dwarves.” Here, somehow, it plays as funny (delightful costumes by Robyn Boyd). Dana Hooley is excellent as the perennial sadsack, Sonia (“I hate my life; I’ve had no life”), and Tom Hall is superb as the repressed pragmatist, Vanya. Their sister, the famous, fading actress (who wanted to be taken seriously, but instead made cheesy movies for lots of money) is drolly portrayed by Wendy Waddell in narcissistic high dudgeon. As neighbor Nina (in the pre-show curtain speech, Virginia Gregg laments, amusingly, that her character’s name isn’t in the title.. and should be), Gregg does her best work ever: the wide-eyed, aspiring actress ingénue, in thrall to just about everyone. Li-Anne Rowswell plays the family’s cleaning woman, Cassandra (a moniker borrowed from Greek mythology, not Chekhov), who, like her ancient mythical forebear, makes prophesies but is not believed by anyone…until her portents come true. One of her best for this stuck-in-a-massive psychological-rut clan is “Beware of thinking too much.” She can go a bit over-the-top, but she’s quite comical. Nearly stealing the show at times is Adam Daniel as the hunky Spike, a kind of brainless wannabe actor who takes his clothes off without provocation, poses and provokes (especially the closeted Vanya) and is addicted to his electronic devices, which makes him rather rude in this family of artistes manqué. He actually texts during Nina’s performance of Vanya’s ludicrously avant-garde play…a rudeness that, in this house, is punishable by death by a thousand barbs. You get the picture. If you know movies or TV or Chekhov, if you’re a Baby Boomer, and you remember all the wonderful old communal activities of your youth (licking stamps, eating Spam, watching “Old Yeller” and having a favorite Mousketeer), you’ll identify with the references, the issues and the feeling of your life’s rug being pulled out from under you by the march of Time. The inter-scene music is mostly ‘60s, but it doesn’t seem to have much to do with the play. Other than that, everything else feels just about right. And finally makes me understand why this comedy was the most frequently produced in the country a couple of years ago. Now, aren’t you due for a bittersweet laugh, too? Performances are Friday-Saturday at 8 p.m., Sunday at 2 p.m.